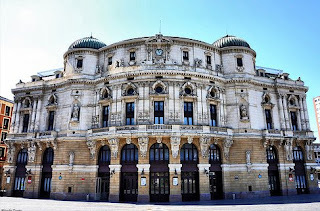 The floodings in Bilbao in August 1983 damaged greatly the Teatro Arriaga Theather which stands in one of the banks of Nervion River. Two years later in 1985 it was reopened and get back in these 25 years all its splendor. Operas like: "Nessum dorma" from Puccini's "Turandot" and "Bella Figlia dell'amore" from Verdi's "Rigoletto". Zarzuelas like: "Luche la fe por el triunfo" from Federico M. Torroba's "Luisa Fernanda", "Barka nazazu" from Guridi's "Mirentxu"
And Vals like: Manuel Fernandez Caballero's "La viejecita", "Belle nuit" from Offenbach's "Les Contes d'Hoffmann"